The robust sound of a concert grand piano has been carefully and lavishly sampled for this digital stage piano. Differences in playing dynamics and position in the stereo field have been faithfully captured, delivering naturally expressive piano sounds that recreate every detail. The SP-250's piano samples are longer than other pianos in its class. Increased length means the piano sound sustains more naturally, so the piano sounds more real throughout the performance, not just at the attack. Three versions of sound are provided in this wonderful and portable digital stage piano to cover different tastes and genre needs. To round out the piano offerings, the SP-250 also features a vintage electric grand sound, as well as an authentic honky-tonk piano. The SP-250 is the first portable digital stage piano from Korg to feature the RH3 real weighted hammer action. 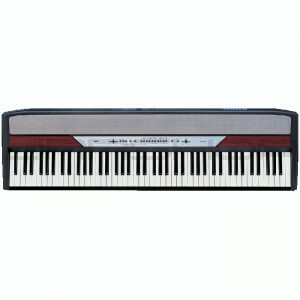 This state-of-the-art key mechanism features differing key weights in each register of the keyboard, delivering the same playing experience as a grand piano. The keyboard is exceptionally responsive, even when playing quickly repeated figures, to preserve every expressive nuance of the performer. The Key Touch Control provides three selectable touch curves, delivering the perfect touch sensitivity for every playing style or type of song. Yet, even with such a robust keyboard, the SP-250 weighs less than 42 pounds (19 kg.). In addition to its remarkable piano sound, the SP-250 portable digital stage piano includes a rich array of sounds that will extend your performance possibilities. An assortment of classic electric pianos (reed and tine styles), church and jazz organs, string and choir sounds, harpsichord and clav(s) elements and even mallet percussion and guitar sounds, are all available at the touch of a button. Two sounds can be layered together to play simultaneously; and of course, you can adjust the balance to get the perfect blend. To help you audition the sounds, 30 demonstration songs ranging from classics to originals are built in to this digital stage piano, showing off all the sounds in a variety of musical genres.